Fractures start with the formation of cracks and occur as the cracks spread in building materials. This causes significant damage to the buildings. Fracture mechanics is a science that investigates crack behavior, crack analysis and what to do for prevention of cracks. In the present study, concrete fracture toughness parameters were investigated by compact pressure test. In this context, research and a series of experiments were conducted on fractures, types of fractures, fracture mechanics, and compact pressure test. In the present empirical study, 5 unnotched and 15 notched, a total of 20 samples were used. 40 mm notches were created on notched samples. Cube splitting experiments were conducted using 10 mm wide strips on unnotched samples. For Type-I, Type-II and Type-III that were used in the calculation of the fracture toughness parameters of the said samples, fracture loads, tensile values and fractured sample details are presented. Since the concrete is a semi-brittle material, compact pressure samples were analyzed according to the principles of linear elastic fracture mechanics. It was concluded that the standard deviation for the critical fracture parameter (KIc) of the sample, which was naturally more stable than the present study, was smaller and as the structure size increased, the fracture toughness value increased as well. Akkaya, Y., Bayramov, F., and Taşdemir, M.A., 2003. Betonun kırılma mekaniği: tasarımda kullanılan mekanik özellikler ile kırılma parametreleri arasındaki bağıntılar. Türkiye Müh. Haberleri, 426(4). Barenblatt, G. I., 1959. On equilibrium cracks forming during brittle fracture, Prikladnaya Matematika Mekhanika (PMM), 23, 434-444. Caglar, Y., 2014. 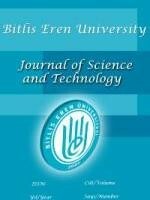 A study on notch and size effect of concrete fracture in mode I, Gazi University, Institute of Science and Technology, PhD Thesis, Ankara, Turkey. Dugdale, D. S., 1960. Yielding of steel sheets containing slits, J. Mech. Phsy. Solids, 8, 100-104. Galilei, G., 1933. Discorsi e dimostrazioni matematiche intorno a due nuove scienze, Elzeviri, Leida, 1638. (English translation, two new sciences, The Macmillan Company, N. Y.) Gettu, R., Saldivar, H., and Kazemi, M.T., 1998. Implications of the size effect method for analysing the fracture behaviour of concrete, Int. J. Solids Structures, 35(31), 4121–4132. Hilsdorf, H. K., and Brameshuber, W., 1991. Code-type formulation of fracture mechanics concepts for concrete, International Journal of Fracture, 51, 61-72. Ince R., 2010. Determination of concrete fracture parameters based on two-parameter and size effect models using split-tension cubes, Engineering Fracture Mechanics, 77, 2233-2250. Ince R., 2012. Determination of concrete fracture parameters based on peak-load method with diagonal split-tension cubes, Engineering Fracture Mechanics, 82, 100-114. Ince R., Gor M., Eren M.E., and Alyamaç¸ K.E., 2016. The effect of size on the splitting strength of cubic concrete members, Strain, 51(2), 135-146. Ince R., Gor M., Alyamac¸ K.E., and Eren M.E., 2016. Multi-fractal scaling law for split strength of concrete cubes, Magazine of Concrete Research, 68(3), 141-150. Ince, R., 2017. The fracture mechanics formulas for split-tension strips. Journal of Theoretical and Applied Mechanics, 55(2), 607-619. Irwin, G. R., 1957. Analysis of stresses and strains near the end of a crack traversing a plate, J. Appl. Mech., 24, 361-364. Jensen, E.A., and Hansen, W., 2001. Fracture energy test for highway concrete-determining the effect of coarse aggregate on crack propagation resistance, Transportation Res. Record, 1730, 10–16. Kaplan, M. F., 1961. Crack propagation and the fracture of concrete, Journal of ACI, 58, 591- 610. Külcü, H. M., 2015. Identification of fracture toughness for flat and tempered flat soda-lime glass by means of indentation technique, Istanbul Technical University, Institute of Science and Technology, Master Thesis, Istanbul, Turkey. Rao, G. A., and Prasad, B. K. R., 2002. Fracture energy and softening behaviour of high strength concrete, Cement and Concrete Research, 32, 247-252. RILEM Technical Committee 50-FMC, 1985. Determination of the fracture energy of mortar and concrete by means of three-point bend tests of notched beams, proposed RILEM draft recommendations, RILEM, Materials and Structures 18(106), 285– 296. Sabir, B.B., and Asili, M., 1996. Stress Analysis of a fracture test specimen for cementitious materials, Cement and Concrete Composites, 18, 141-151. Sorucu A., 2007. The determination of crack propagation and fracture toughness in orthotropic materials, Dokuz Eylül University, Institute of Science and Technology, Master Thesis, İzmir, Turkey.